We've just created a Patron page. Love the series? You can help Clare keep making it by pledging as little as $1 a month towards our running costs. Click here! Yves Saint Laurent, Loulou de la Falaise, Pierre Cardin, Chanel, Givenchy, couture, prêt-à-porter and vintage shopping in the Paris flea markets, this week’s Episode trés chic. 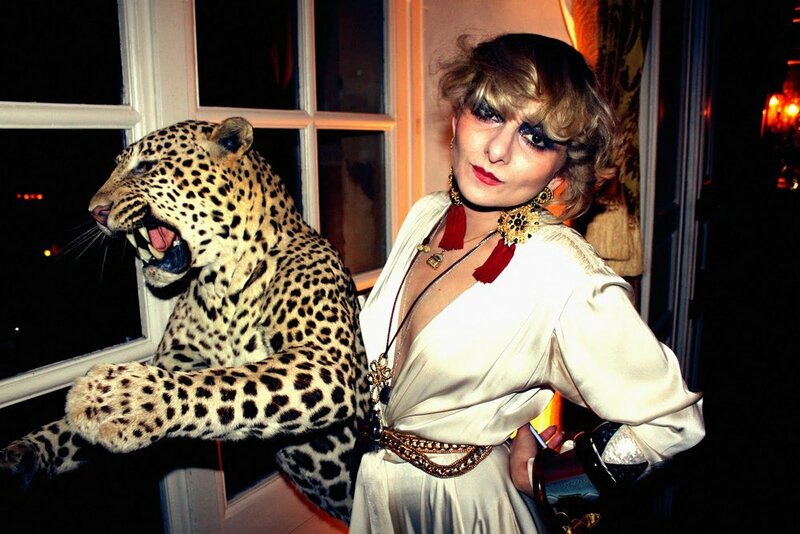 My guest the Paris-based Australian-raised stylist, César-winning costume designer, and vintage genius Catherine Baba. You need to follow her on Instagram. Vogue calls her a “fashion eminence”. Vanity Fair? An “original”. Indeed that magazine just included her on its 2017 Best Dressed List. Catherine always looks fascinating in her turbans, Louboutins and armfuls of bangles, perhaps with a 1920s robe and lamé harem pants, or a 1970s Halston jumpsuit. Catherine is also an accessories designer with her own line of sunglasses, a massive vintage fan and a walking fashion encyclopaedia with a particular fascination with the history of Paris fashion in the 1970s. But best of all, she's a mad keen cycler. Could there be a more glamorous of eco-aware-transport influencer? Pas possible! 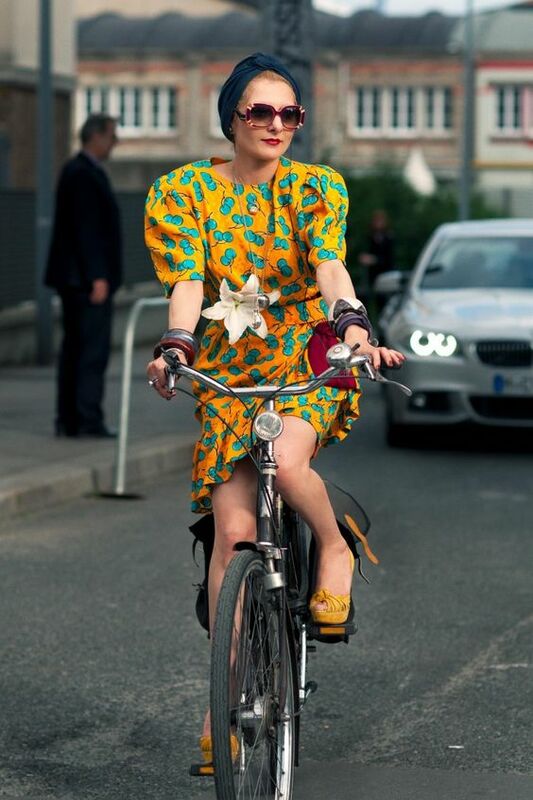 Riding a bike to the fashion week shows wearing a vintage kimono, high heels or even couture? No problem, darling. “It creates an aero-dynamism to the look,” catherine baba on cycling. CARS are massive polluters and multi-lane freeways cost silly money to maintain while spoiling the air. DID YOU KNOW that Cycling could save cities $25 trillion and 10% of transport CO2 emissions by 2050? We recorded this interview at the Perth Fashion Festival soon after Yves Saint Laurent’s partner Pierre Bergé died, and in our conversation we drill deep into what makes Paris fashion tick and how it has changed. Catherine moved to Paris in 1996, and worked for Chanel, Givenchy and made friends with Jeremy Scott. She has been collecting vintage Saint Laurent since she found her first blouse for $8 in a flea market. This Episode is an insider's guide, a companion piece to Episodes 12, 13 & 14 with Simon Doonan, Stephen Jones and Linda Jackson. For anyone who loves the creativity and artistry that makes fashion tick, these shows are for you. For the definitive (and juicy) read on the YVES SAINT LAURENT story, Clare recommends The Beautiful Fall by Alicia Drake. This is Majorelles - don't you wish you could move in there? The legacy continues...TWO new museums dedicated to Yves have just opened. The Musee Saint Laurent Marrakesh occupies a new building opposite Majorelle. In Paris, the The Musée Yves Saint Laurent Paris exhibits the couturier’s body of work on the legendary premises of his former haute couture house. WHO WAS LOULOU? This is form the museum website: "Along with Betty Catroux, Louise de La Falaise was one of Yves Saint Laurent’s closest friends. Born in England in 1948, she was the daughter of a French aristocrat and an Anglo-Irish mother. She spent some time as a model before going on to design fabrics for Halston and working for the magazine Queen. When they met in 1968, Saint Laurent was immediately charmed by this bubbly young woman who dressed in flea-market finds, coming up with outfits that were both elegant and unique. Loulou began working at the studio as early as 1972 and remained at Saint Laurent’s side for thirty years. She was quickly put in charge of accessories, which she liked to be colorful and voluminous. She also handled the knitwear line. After the haute couture house closed in 2002, Loulou continued to work in fashion and opened a boutique under her own name. "Other than her undeniable professional qualities, Loulou de La Falaise’s real talent was her charm. Particular. Moving. It was the strange power of a gift for lightness blended with irreproachable acuity and her eye for fashion. Intuitive, innate, particular. Her presence at my side was a dream." - Yves Saint Laurent. Marche aux Puces de Montreuil is a PARIS FLEA MARKET in the 20th arrondissement. Catherine says it's not what it was when she bought her first vintage Yves Saint Laurent blouse there in the '90s. Here's Time Out's list of Paris flea markets. This NYT story offers some good tips. Can you believe there's a dedicated website called FLEA MARKET INSIDERS? Believe it. And bookmark it. ZAZOU was the French WWII subculture that was a precursor to punk. The zazous were a subculture in France during World War II. They were young people expressing their individuality by wearing big or garish clothing (similar to the zoot suit fashion in America a few years before) and dancing wildly to swing jazz and bebop. Men wore large striped lumber jackets, while women wore short skirts, striped stockings and heavy shoes, and often carried umbrellas. "Hats were far too large, skirts far too short, jackets far too long, shoes far too heavy... I have no doubt that this zazou style originated in a desire to defy the forces of occupation and the austerity of Vichy. For lack of other materials, feathers and veils, promoted to the dignity of flags, floated through Paris like revolutionary banners. " THE LITTLE PRINCESS, for which Catherine won her César (the French equivalent of an Oscar) for costume design is a 2011 French-Romanian drama film directed by Eva Ionesco and inspired by her relationship with her mother, the well-known artistic photographer Irina Ionesco, whose pictures of her young daughter caused controversy when they were published back in the 1970s. The film illustrates a situation which at first glance seems to be a paradox: whilst revealing more and more of her daughter to the public the mother seems to get increasingly estranged from her and vice versa.